We are proud parents of our beautiful daughter Lia and work always as a team. We can’t wait till we have ideas where we can express to the world our love for newborns and photography . We specialize in light, natural and organic newborn, maternity and family portraits. We focus on creating posed and natural looking newborn portraits including parents and siblings as much as possible. 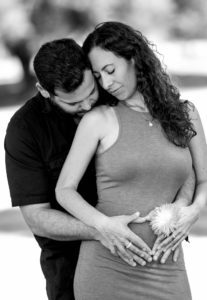 You may be surprised to know that we have spend hundreds of hours (and dollars) training and gaining experience in order to learn the craft and art of Newborn Photography. It is such highly skilled and professional niche, that few photographers even attempt it. For us however, it was always a completely natural transition. We have worked with kids and babies her entire life, and have always had a way with them. The most frequent comment we get is how patient Beverly is. Once you have your newborn session, you will see how much goes into creating each and every image. We are both perfectionists, and work hard to make sure every little finger and toe is in place. When you realize how much goes into Newborn Photography, from the posing, to the knowledge of newborns and what environment makes them feel peaceful, to the lighting, the camera settings, the right lens, and an extensive knowledge of photoshop and editing skills related to newborns, you start to understand why your friend down the road cannot get the same image. We love to try new and interesting ideas and create new outfits, buckets and backgrounds every few months. Beverly hand-makes most of our outfits and Steven is the artist behind the camera. We are passionate about photography and found an even deeper love for newborn photography, and grow our family by 1, earlier this year we had our own newborn, Lia. We have both had our Tdap and Whooping cough shots and never shoot if we feel the slightest bit sick. We are insured and take great care to have all our items washed after every session. Please reach out and call or text for more information if you have any questions whatsoever as we can’t wait to meet you and the baby.